I was born and raised in a mostly rural section of Kansas. After attending and teaching in the Graduate Schools of Baylor University and the University of Kansas, I came to the Southeast to teach at Auburn University. ​I spent several years teaching and consulting in the areas of communications, risk management, insurance, finance, leadership development, human resource management, marketing, and business growth and development. God was putting good miles on my odometer that were preparing me for church administration and to help facilitate His ministries. I’ve been blessed to serve in church administration now for more than 17 years. My best friend and lovely bride, Keita, and I love serving the Lord together and are proud to call CCC and Columbus home. Favorite foods: Love to fire up the grill. Authentic Mexican and Italian are always good. Keita’s made-from-scratch banana pudding has to be a little glimpse at heaven. I count carrot cake among my favorite vegetables. Favorite movie: Love classic confrontations of Good vs. Evil. Love Sci-Fi with great cinematography – Star Wars movies, Star Trek movies, the Lord of the Rings trilogy. Hobbies, pastimes and interests: Fishing, photography, golf, racquetball, attending NCAA sporting events. Ambitions/aspirations: Getting better at serving Him and others daily. Striving to remain obedient to the “Call” He has placed on my life. 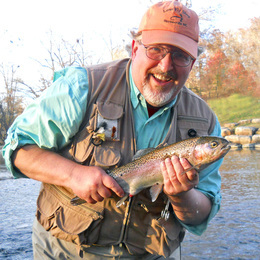 What I like to read: Fly Fishing or photography stuff for fun. Favorite authors include Yancey, Strobel, Hybels, Bevere, Stanley (Charles and Andy), Maxwell, Nouwen and Lewis. People are surprised to know: A long, long time ago in a galaxy far, far away, I was first-chair tuba in the Kansas Music Educators Association All-State Band. My staff role at CCC: As your Church Administrator, I am blessed to help facilitate the Ministers, Missions and Ministries of CCC. My primary areas of responsibility include: facilities, oversight of all administrative systems, supervision of the Administrative Assistant Team, oversight of the Resource Management Team (Facility Team, Finance Team and Personnel Team) and serving on the Senior Leadership Team (SLT). What I enjoy most about serving at CCC: My goal in searching for a place to serve is to find out where God is at work and join Him there. Clearly, God is up to much in and through His people here at CCC. It is a life-giving, invigorating place to worship and serve.